2 hours of fun in the Mediterranean Sea! Get Your Sea Legs On! Whether you and the lads are readying yourselves for a heavy night or recovering from one, some time in the warm, clear Mediterranean sea is a must for any stag do in Barcelona! This jetski and boat combo pack has you covered! 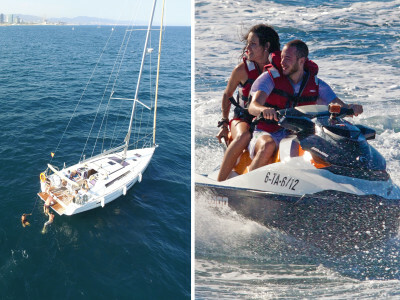 Your group will spend two hours tearing through the water on a jet ski and doing your best Captain Jack Sparrow impression in a sailing boat! The ultimate way to chill out, pull off some tricks and spend time with the lads under some golden sunshine! The number of jet skis and boats available depends on the size of your group. Regardless, you are guaranteed 15 minutes of jet ski driving time per person. We take care of insurance, safety equipment and forms, so you can focus on the fun! Oh, and don’t forget to bring along a towel, swimsuit and some sun cream!